In an environment of persistent earnings multiple expansion, investors have had to look hard to find quality value names. With confession season largely behind investors in Australia, some names in the Small Caps space have come out relatively unscathed and appear poised to meet guidance (with some featuring the cherry on top of attractive valuations). PPE provides contracted staffing and human resources (HR) outsourcing services to companies in Australia and New Zealand, focusing on sectors exposed to structural tailwinds, such as disability care, which is poised to grow from the NDIS coming online, and infrastructure, which is currently a beneficiary of government stimulus at both the state and federal level. PPE’s revenues are essentially a function of wages paid to staff hired through PPE, with the ongoing prevalence of meagre wage growth in Australia appearing not to be an issue for this business given its focus on growth sectors. These revenues have been and will continue to be beneficiaries of the ongoing expansion of the casualisation of the labour force, given that providers such as PPE are engaged by organisations to hire casual and part-time staff. PPE also advises it maintains a competitive position in the market in which it operates as a result of long-standing relationships, provision of innovative technology and a favourable safety record. The company also acquired a 50% interest in IT recruitment business, Recon, during 2H FY18, equipping PPE with exposure to the growing IT industry. Listing in only late 2017, we invested at the IPO at an issue price of $1.00/share and so far have realised a return of 60% as at the end of June 2018. The icing on the cake is that despite this impressive return it still trades on a reasonable valuation. INA is an owner, developer and manager of a portfolio of senior lifestyle communities and holiday parks, predominantly concentrated on Australia’s eastern seaboard. The business consists of three key divisions, the first being its Lifestyle & Holidays operations, which comprises a rental income stream earned from operating land lease communities for seniors as well as holiday parks, along with revenue from the sale of manufactured homes in its development pipeline. Its second division is the Ingenia Gardens portfolio of rental communities for seniors and the third being its Deferred Management Fee (DMF) communities portfolio, Ingenia Settlers, which is a non-core business and has been scaled back overtime through divestment as INA increases its focus on land lease communities and providing an affordable offering in the family holidays space. As a background, land lease communities are an alternative offering to retirement villages, which impose a DMF on residents when they exit a community, which can represent an amount from 25% to 50% of the original purchase price. Land lease communities, on the other hand, do not see residents incur such a cost, with the resident essentially purchasing the home only when entering and then leasing the land from operators such as INA over the time they live in the community. With only having to purchase the home, the entry price point is rather attractive. Moreover, as a result of the land lease agreement, downsizers are not subject to stamp duty. INA offers exposure to the tailwinds of an ageing Australian population seeking to downsize and unlock home equity. 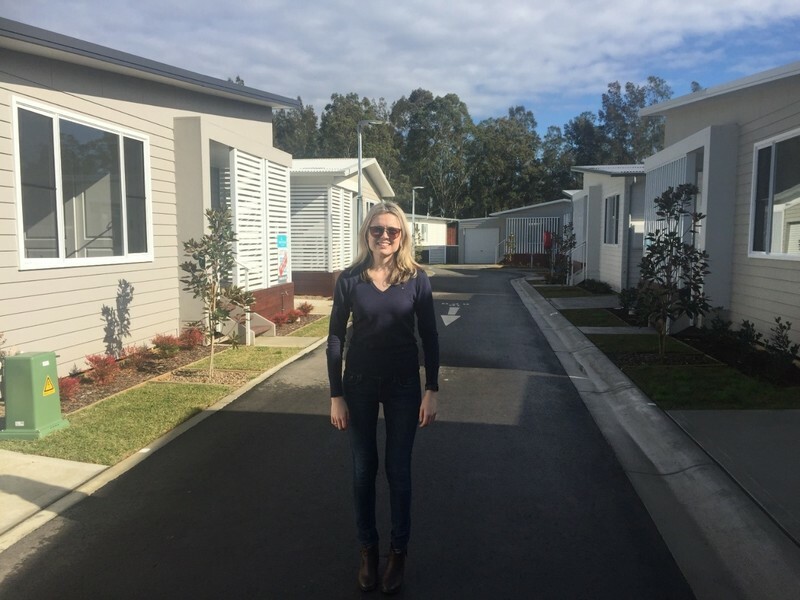 It has a diverse portfolio of land lease communities across New South Wales, Victoria and Queensland, and is currently pursuing greenfield development projects which offer higher quality and more sophisticated homes, catering to growing interest in such an offering by retirees and downsizers. Recently, INA has upgraded its guidance for FY18 on the back of its success in meeting target settlements in its Lifestyle & Holidays development efforts. From attending an Investor Site Tour subsequent to this upgrade, it was evident that INA is focused on effective sales and marketing to drive settlements, along with process being made towards ramping up development at its first greenfield project, Latitude One, in Port Stephens. Above: Marni Lysaght at Ingenia Site Tour, Central Coast, June 2018. INA currently trades at an attractive P/E and EV/EBIT multiple. Shareholders also gain exposure to a reliable rental yield through the Ingenia Gardens segment, which has historically recorded occupancy levels north of 90% and its resident’s beneficiaries of rental assistance from the government. Investor interest in the sector has increased following the takeover offer for peer Gateway Lifestyle Group (ASX:GTY) by Hometown America.